It’s no secret that MEATliquor have become extremely renowned for their burgers in recent, even in so far as inspiring colossal queues to form, in order to visit the no-reservations restaurant during peak times. With various outlets now open across the city, as well as branches in Brighton, Bristol, Leeds, and Singapore, the chefs are also set to make an appearance at this year’s Taste of London festival, taking place in June at Regent’s Park. 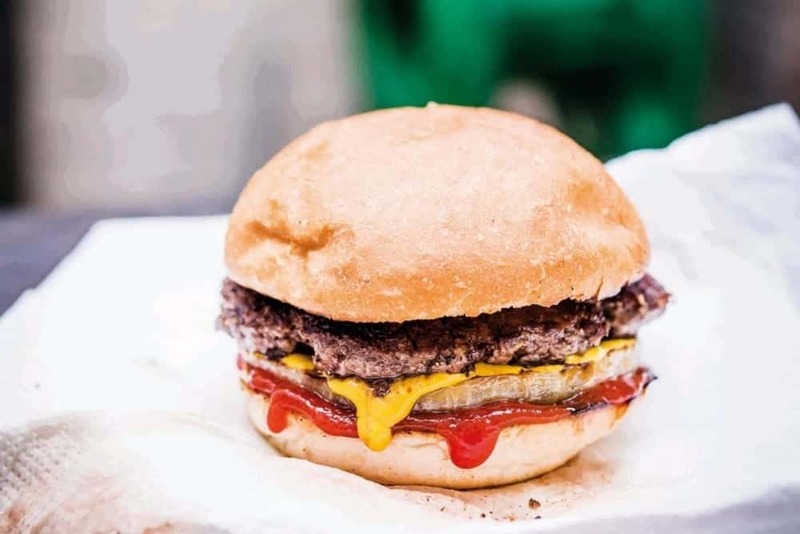 What’s more, to mark their involvement the culinary celebration, as well as welcoming this year’s impending barbecue season, MEATliquor have shared a recipe in order for readers to recreate their interpretation of the perfect ‘Backyard Burger’. Light your charcoal, preferably with chimney starter rather than chemical fire starters. The coals will need to burn down to cooking temperature. Be patient: this will take a while. When the coals are coated with white ash (they will glow red in the dark) and all the flames have died down, you’re ready to cook. Pull out a wad of ground chuck steak and form it into a ball with your hands. Squash this down onto a sheet of greaseproof paper so that it forms a burger patty. It should be a bit bigger than the bun to allow for shrinkage during cooking. Place the patty on an oiled preheated barbeque grill and cover the top side with a healthy dose of salt and pepper. Put the thick slice of onion on the barbeque too. Meanwhile, cut the bun in half and toast the cut sides over the barbeque. This will only take a few seconds. When the bottom of the burger has formed a good brown crust, it will easily lift off the barbeque without sticking. Flip it and cook the other side. It won’t take nearly as long. Flip the onion when it starts to brown. Lay a couple of slices of ‘cheese’ over the burger while it’s still on the barbeque. Squirt some Heinz ketchup and French’s mustard on the bottom of the bun. Stick a couple of slices of dill pickle on there. Lay the burger onto your bun base and stack the onion on top. Put the bun lid on top and serve immediately. Further information on MEATliquor can be found at meatliquor.com. MEATliquor will also be appearing at Taste of London this year, taking place between 15th-19th June. Tickets can be purchased online at tasteoflondon.co.uk.